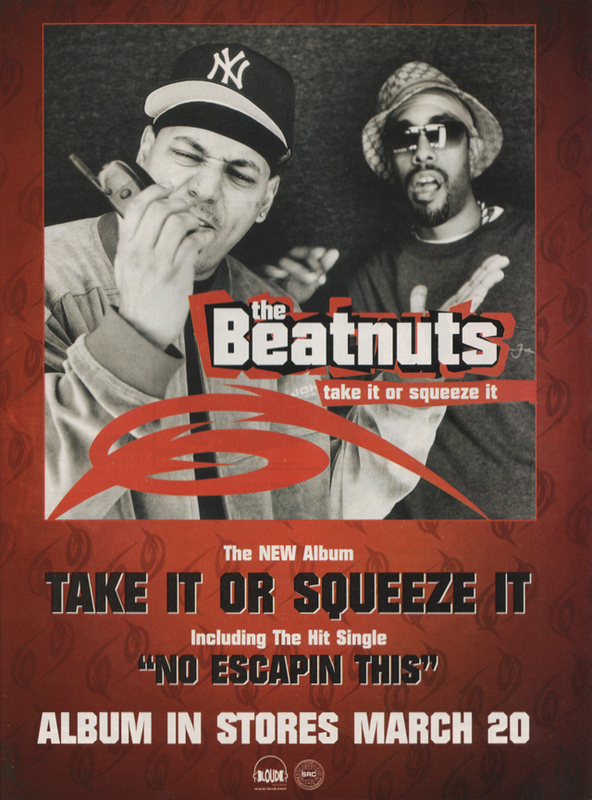 It’s been 16 years since The Beatnuts released ‘Take It Or Squeeze It’ on Loud/Epic Records. Taken from their album press kit: ‘To reign at the top of your game, it’s not enough to have just lyrical expertise tucked in your backpack of skills. You have to be able to man the boards, direct musical content and deliver verses that will appeal to the underground while whetting the appetites of the mainstream. 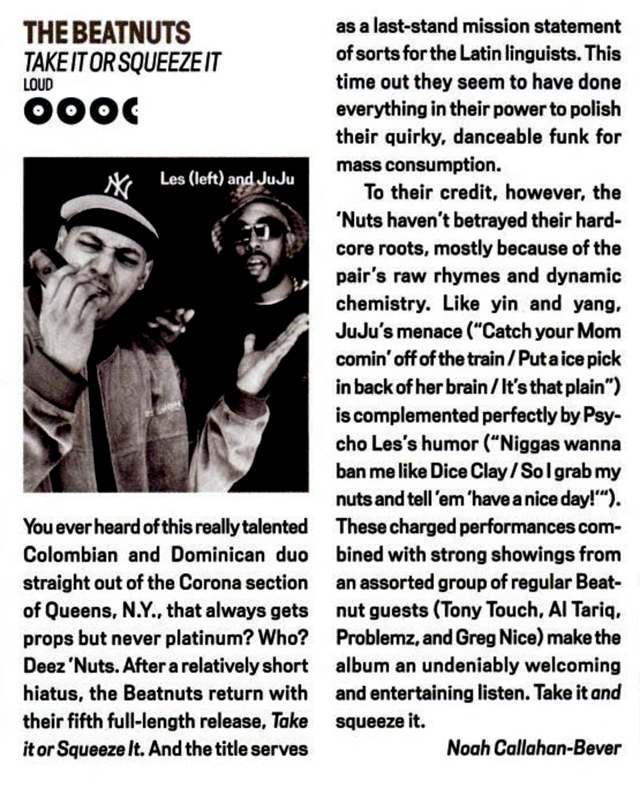 For more than seven years, the Beatnuts have fulfilled these necessary requirements displaying their ability to relentlessly issue the illest instrumentals paired with blistering hot lyrics.’ Yes, I agree Psycho Les & Juju are all those things. Yet, while their radio-friendly single, ‘No Escapin This' showcased their ability to reach both markets, did they have the content and a big enough second single to really capture the attention of that market? In retrospect, perhaps not on this album, but keeping true to their Queens roots, they never lost the underground. With an extensive catalog, production on classic albums and fan favorites, not to mention getting royalties from producers who jacked their style, The Beatnuts are cemented in hip-hop history. Happy 16th anniversary to ‘Take It Or Squeeze It;’ check the review above from the April '01 issue of Vibe, original advert and the press kit below. 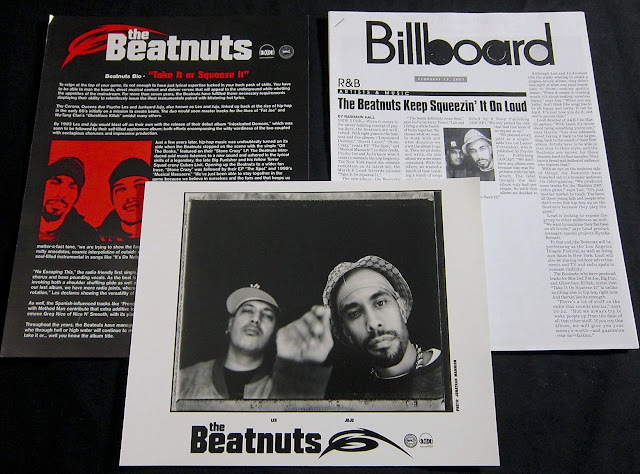 What's your favorite track from The Beatnuts?